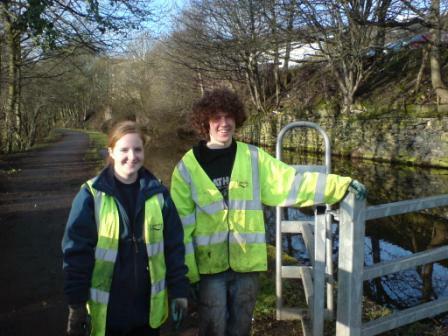 Here is Sarah Kennedy (19) and Simon Hogson (21) who are currently Apprentices at Calderdale Local Authority. Both presented on their experiences as an apprentice and on the work projects of the 'Lock Keepers Cottage and the Coal Chutes' to Northern Amenity Forum at York Race Course in January. Simon commented "I've had dead end jobs before and that. But now I feel like I'm getting a career at Calderdale"
Mark Dempsey (Services Support manager at Calderdale Local Authority - Grounds, Parks and Gardens) I have ashort chat about the impacts the Apprentices/mentees are having in the wider community.